Because this is a photospread, I’ll do my best to restrain myself when it comes to talking about some exceptional clownfishes. I simply want to show off some great, mature designer Gold Stripe Maroon varieties that I photographed last fall in the main display reef aquarium of fellow Duluth, MN, marine fish and invertebrate breeder Mike Doty. Astute readers may note that I’m using the name Premnas sp. 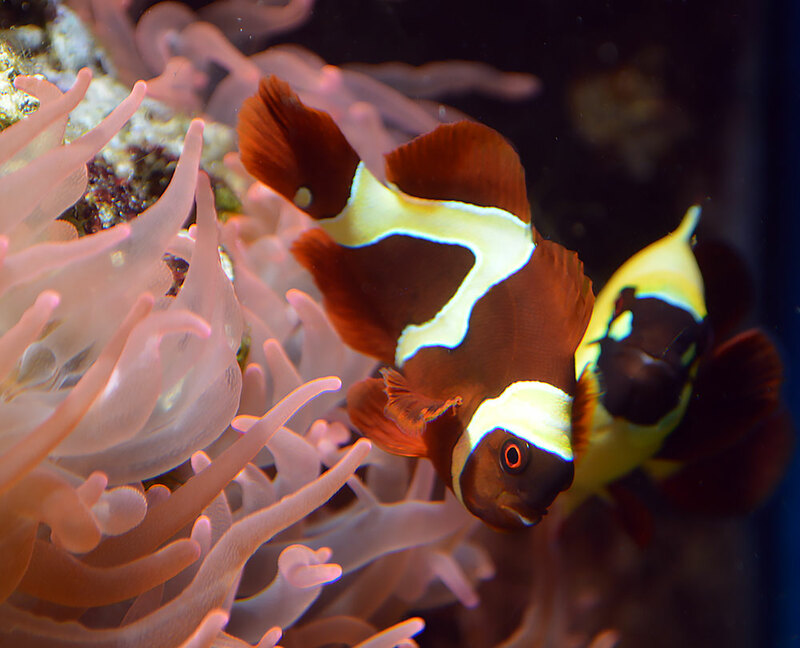 epigrammata with these fishes; original Goldflake and Gold Nugget Maroon clowns were all derived from pure lines of Gold Stripe Maroon Clownfish (GSM), which are native to the Indian Ocean. While official taxonomy currently considers GSM to be the same species as the White Stripe Maroon (WSM), lumping them as Premnas biaculeatus, I’ve laid out some of the arguments against this view in prior articles. Regardless of taxonomic status, it’s very clear that there are in fact three distinct groups of Maroon Clownfish, and from a breeding and species integrity standpoint, keeping these forms distinct maintains valuable biodiversity within the aquarium trade. Premnas sp. epigrammata “Gold Flake” ORA, with a “Gold Nugget,” also ORA breeding, in the background (right). I’ll just mention briefly that the Gold Flake Maroon–originally dubbed by Sustainable Aquatics in 2007–arrived first on the scene. These fish were primarily GSMs with extra spots. Similar fishes showed up in the breeding of Houston, TX-based aquarist Mike Hoang in 2011, which included some more intricate patterning, although further breeding didn’t yield any promising results. Meanwhile, just a year later (in 2012), ORA introduced their own line of Gold Flake and “Gold Dot” Maroon Clownfish. At that time, there were already hints of solid gold Maroon Clownfish in the works, and by mid-2013, the fish were formally introduced as Gold Nuggets. 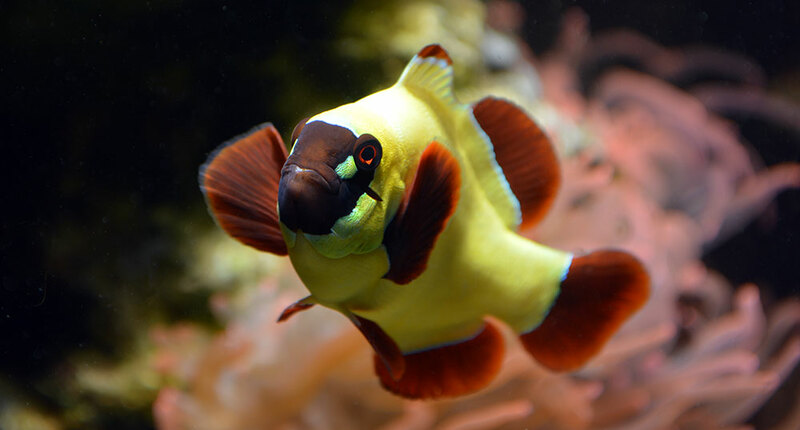 These fishes likely represent the genetic foundation for the majority of Gold Flake and Gold Nugget Maroon clowns we now see in the marketplace. In 2014 we saw the introduction of the “Gold Rush” variation of Gold Flake Maroons, the Gold Rush being fish that had connecting horizontal striping (but I suspect are genetically no different than Gold Flake Maroons), along with Pearl-Eye Gold Flake Maroons, both out of the breeding facilities at FishEye Aquaculture. In all pure Gold Stripe Maroons, both the wild type form and the various designers, the bar coloration in juveniles is white. A juvenile Gold Nugget Maroon Clownfish, reared by Proaquatix, shows the white coloration of juveniles. Only 9 to 15 months later (based on personal observations), yellow coloration starts to form, and in several more months, it reaches a vivid state. Premnas sp. epigrammata “Gold Nugget” ORA, showing off vivid mature yellow coloration that only comes with age and your patience. The fact that Premnas sp. epigrammata doesn’t reveal the hallmark gold coloration in the bars/stripes/patterning until generally a year of age makes the marketing of these fishes rather difficult. In truth, when wild-type, 3-barred Gold Stripe Maroons are juveniles, they are completely indistinguishable from White Stripe Maroons. Because of this, buying juvenile fishes requires the consumer to trust the vendor, and therefore the entire chain of custody. Wild-sourced fishes are obviously going to be true-to-type, as long as you can trace their origins. Up until recently, we didn’t have to worry about the purity of our Maroon varieties. If a fish purchased as a White Stripe turned Yellow–oops…someone made a mistake. The designer forms were much easier to tell apart, for the most part, since Morse-Codes and Lightings were restricted to the White Stripe Maroon stocks out of PNG, and Gold Nugget & Gold Flake types were purely GSM. 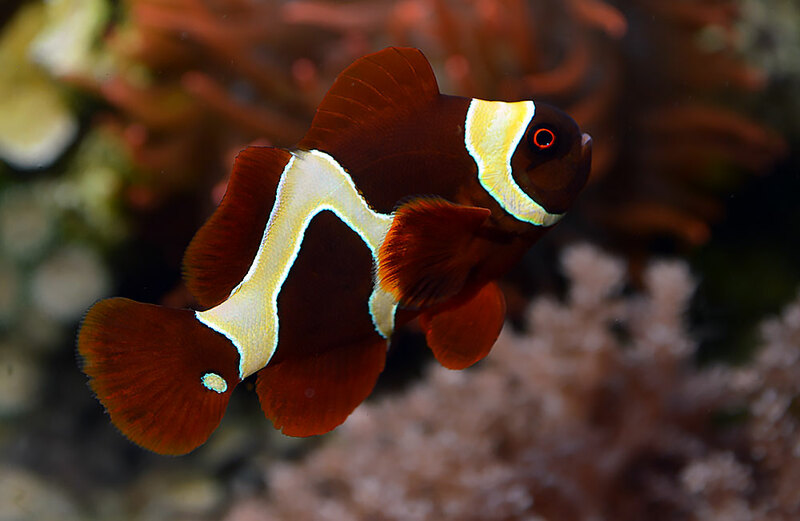 However, amateur and professional breeders alike can now be blamed for the release of hybrids between WSM and GSM, generally in the pursuit of other designer clownfish breeding goals. Some of these fishes are marketed under the “White Gold” Maroon Clownfish moniker (including White Gold Lightning), while others may be quietly releasing these fishes without disclosing their hybrid nature. Of course, the problems with these hybrids are many, particularly from a conservation/species preservation standpoint, but on the most fundamental basis, you could argue that with a White Gold Maroon, you either get a “white stripe” that gets a little yellow that you didn’t want, or a “Gold Stripe” that never lives up to the full potential as a GSM. The history of the Gold Flake and Gold Nugget suggests that the two forms are genetically linked/related, but third-party proof has yet to be shared. First, what is known: Gold Nugget mated to Gold Nugget yields exclusively more Gold Nuggets. The mating of any two Gold Nugget Clownfishes so far only yields more Gold Nuggets. Where does that leave Gold Flake? Some individuals breeding with the earliest of Gold Flake specimens, pre-ORA, suggested that these fishes were possibly simply aberrations that didn’t have a genetic component. To date, I haven’t seen any direct breeding results with Gold Flake mated to Gold Flake, Gold Nugget, or wild-type Gold Stripe Maroon. Premnas sp. epigrammata “Gold Flake” ORA; what is the exact genetic makeup of this fish? Based on the information at hand, and considering what we believe we know about the relationship of Picasso and Platinum in Amphiprion percula, I would hypothesize that at least in ORA’s case, their Gold Flake Maroons are the “single dose,” or heterozygous state, of a single mutant allele (gene) that is partially dominant in its expression. Thus, the Gold Nugget Maroon represents the homozygous, or “double dose,” state for the same gene. Is it possible that the Gold Flake Maroon Clownfish represents a genetic midpoint between a wild-type GSM and a Gold Nugget Maroon? As you can see, I’m only aware of the last test mating having actually been completed. There are 4 tests to go. It should come as no surprise now why Mike Doty and I opted to set up this Gold Nugget X Gold Flake pairing that I’ve been showing in the photospread: we’re hoping for the 50/50 results! But, perhaps you’ve already done one or more of these test crosses? If so, please consider sharing your results; add them in the comments below and if you have links to more info/images/pictures, please do share them! Regardless of the interesting genetics and history of these designer clownfishes, I should mention that Gold Stripe Maroons have a reputation for being less aggressive than their white stripe counterparts. That’s certainly proven in the breeding environment; they tend to be easier to pair, and the juveniles do not destroy each other in grow-out, the way White Stripe Maroon offspring can. 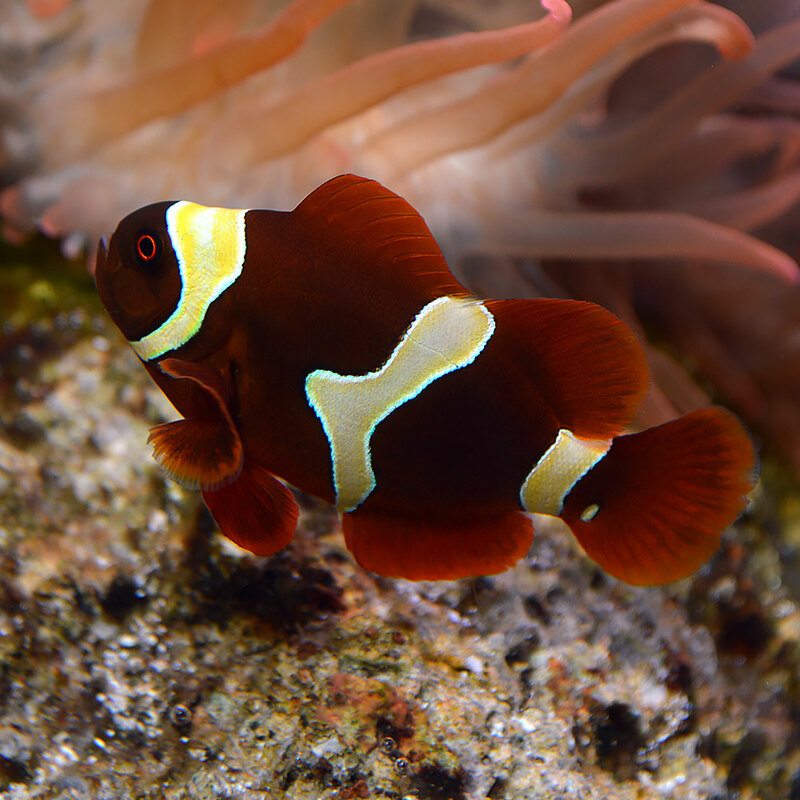 Most Maroon Clownfish aggression is directed at other clownfish or potential mates when first pairing. 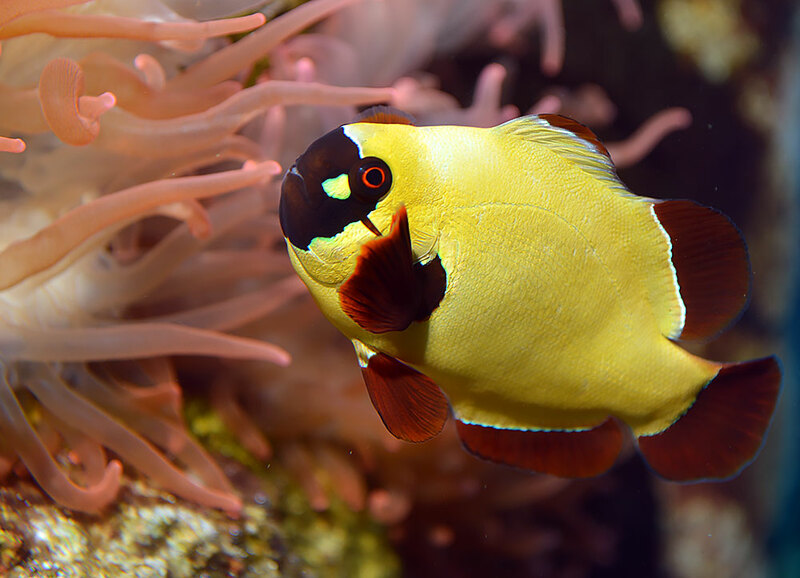 When breeding, they will vigorously defend their nests; you cannot fault a Maroon Clownfish for perhaps attacking the Yellow Tang that’s trying to steal their eggs! For the most part, though, this is the limit of aggression with most clownfishes; tankmates that are not competitors or trying to go after a nest, are generally left alone. If the fishes grow up together, even better. Captive-bred Gold Stripe Maroons of any variation make good starter fishes, especially when purchased young (and not acquiring someone’s mature pair they want to get rid of). A breeding pair can easily be kept in a 10- or 20-gallon aquarium; they’d make a great focal piece for a smaller reef. They don’t need an anemone, but they certainly do appreciate a Bubble Tip Anemone, Entacmaea quadricolor, if offered (and these too can easily be obtained as propagated organisms). 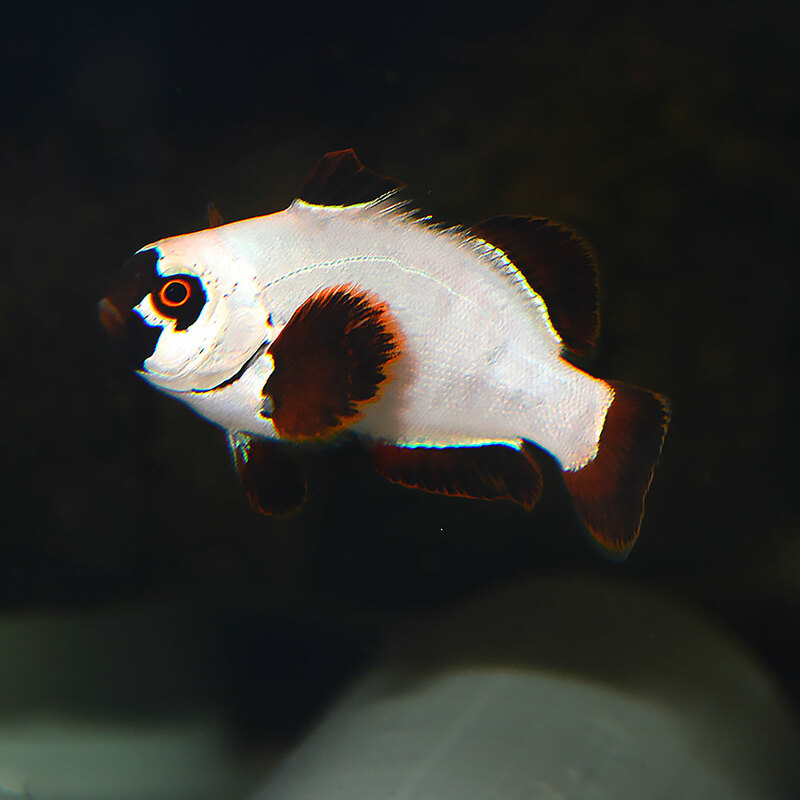 Maroon Clowns do have the habit of digging when getting into spawning situations, so that is something to consider and prepare for if you want to have a sand substrate. 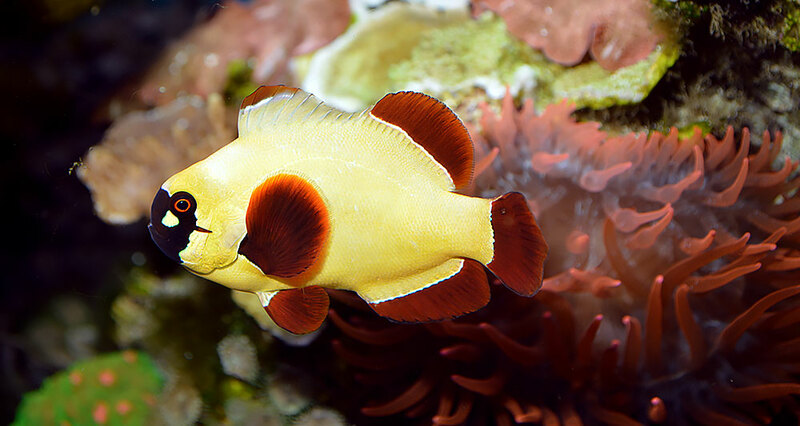 Disease-wise, Gold Stripe Maroons are susceptible to the usual range of pathogens, just like any other clownfish. Be on the lookout for Brooklynella, Uronema, Amyloodinum and Cryptocaryon; these are probably the most likely to cause problems with your Gold Stripe Maroons. Know how to treat these diseases, and have access to the proper medications before you buy your fish. Buying from reputable sources and instigating rigid quarantine protocols will pay off. If buying individual fish with the hopes of pairing them, aim for large size disparities and have a way to slowly introduce and/or isolate the fish to prevent any fatalities during the “dating” period. Always carefully watch newly-paired Maroons of any variety, and separate them at the first sign of trouble. It pays to remember that the difference in pricing between a captive-bred Gold Nugget, Gold Flake, or Gold Stripe Maroon is simply one of supply and demand. Underneath the differences in appearance caused by possibly one mutant gene, they’re all the same easy-to-care-for fish. 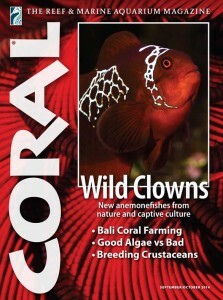 New Age Mutant Clownfish and Playing With Matches: Hybrid Clownfishes, by Matt Pedersen, published in the September/October 2014 issue of CORAL Magazine, WILD CLOWNS. Click the cover below to order this issue. 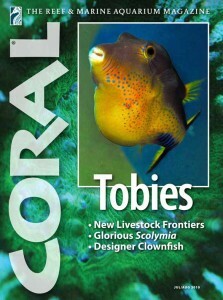 Designer Clownfishes: Triumph or Travesty by Dr. Matthew L. Wittenrich, in the July/August 2010 issue of CORAL Magazine, TOBIES. Click the cover below to order this issue.